Remember those Little Debbie oatmeal creme pie thingies? I think those are kind of disgusting, but love the concept. 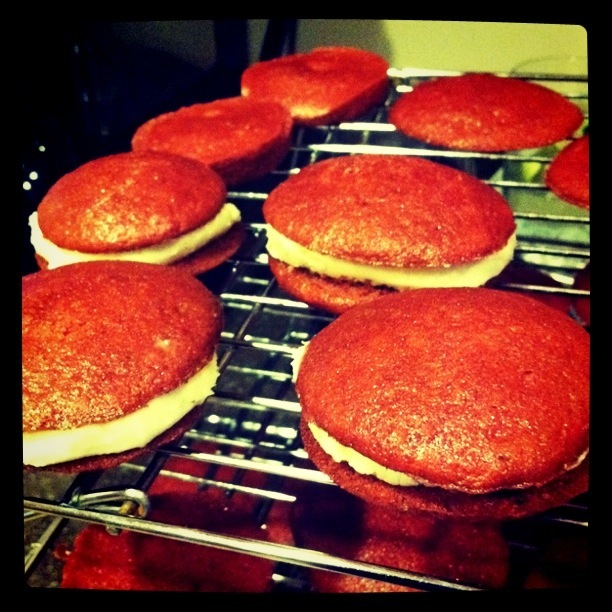 Enter Red Velvet Whoopie Pies. We are having a party in a few weeks and stumbled across this little recipe. But these? I promise are worth it. But I must admit something: It took me 3 batches to get it right. The first time I made them, I forgot the baking soda. The second batch tasted fine but didn’t set right. They were supposed to be perfectly cute little circles and ended up being kinda…flat ovals. Apparently you can over-grease a pan. So, since the third times a charm, I tried it again. Sure the gel coloring is probably a little better for you and it makes a lot less mess, but just go with the bottled stuff. The color was prettier and the batter set better. Don’t grease the pan. Use wax or parchment paper and gently peel them off once they cool. Make twice as much icing as suggested. It’s goooooood. You’re gonna want more than one tablespoon per pie. If 24-36 whoopie pies sound like a lot to you, don’t consider cutting the recipe in half. You will eat them all, I promise. And if you don’t, they freeze well. We tried that last night and I’m happy to report that they are just as delicious as the fresh ones. So, go forth all ye bakers and get to work. Or at least save this recipe for Christmas or Valentine’s Day. I wonder if you could make them green? I don’t see why not? Think about how cute that would be!